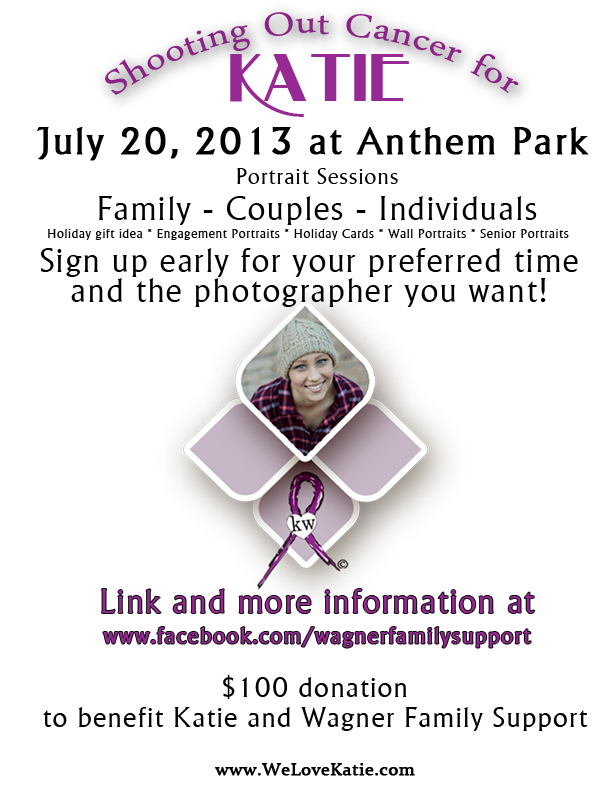 I’m going to be participating in a wonderful event this coming weekend… Photographers from all around the valley are donating their time and talent to raise funds for WeLoveKatie.com – Katie Wagner and her family as she battles her second round of cancer and to pay it forward to WeCare in Anthem. It’s a great opportunity to get some portraits and help a good cause! When and Where will our portraits be taken? July 20, 2013 at Anthem Park from 8:00am-Noon and from 3:00pm-7:00pm. (Sign ups every 30 minutes.) Pick your photographer and the time for your portrait. Arrive about 15 minutes before your selected time at the main gazebo at Anthem Park. You will be directed to your photographer’s location and your portrait session will last about 20-30 minutes. Anthem Park is located at the intersection of Anthem Way and Gavilin Peak in Anthem, Arizona.